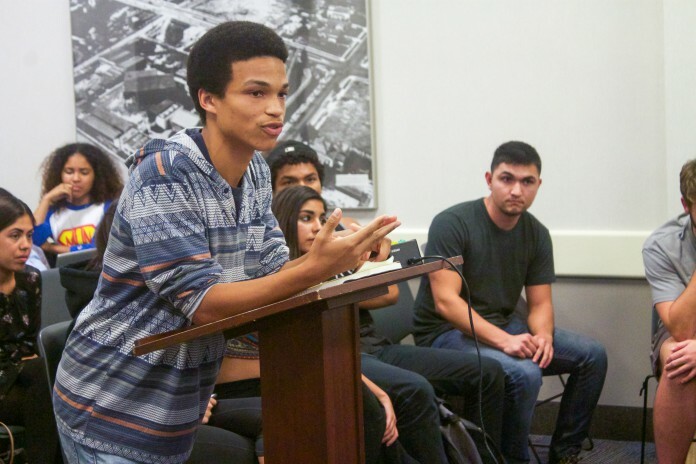 Members of the Student Commission on Racial Equality argued against a bill to update Policy 28: Associated Students Conference and Retreat Policies and Procedures at the Nov. 12 meeting of the AS Senate at the University of California, Santa Barbara. Although the EVPSA at the other UCs holds this role already, UCSB’s current EVPSA Melvin Singh has not taken jurisdiction over the delegation for the Student of Color Conference. Currently, the SOCC delegation selection process has been headed by SCORE. Bettencourt stated that the SOCC delegation should be chosen by SCORE, since they represent minority students, which make up roughly 50 percent of the UCSB undergraduate student population. According to the 2013-2014 UCSB Student Profile, 25 percent of students identified as Chicano/Latino, while 25 percent also identified as Asian/Pacific Islander. Another four percent of students identified as Black or African American, and one percent of students identified as American Indian. Additionally, Covington discussed whether partisanship was a factor in the delegation selection process, because many SCORE members have past affiliations with political parties on campus. Several senators, including On-Campus Senator Matthew Santos and Off-Campus Senator Brandon Lee, attempted to compromise with Bettencourt and Covington regarding the language of the bill, but both SCORE members stated that they would prefer to have the bill withdrawn rather than rewritten, stating that they would be willing to discuss the matter at a later date. SCORE non-board members also spoke during public forum, including United States Student Association National People of Color Student Coalition Chair Leilani Riahi. The Bill to Update Policy 28 was discussed at the Nov. 13 meeting of the AS External Affairs Committee. They proposed amendments for the bill and will be communicating with SCORE, as well as AS Lobby Corps, to make sure the amendments are agreeable to both parties.